My husband has been telling me this for years! It's time for the Sunday Night Chit-Chat hosted each week by Carla at My 1/2 Dozen Daily. Carla has been doing some serious sewing lately and her creations are beautiful! Let's get started with the Chit-Chat! Cooking/Baking...I made brown rice and pinto beans tonight. I made granola today. Looking forward to next week...It is time again for my Happy Stampers to meet:) I always look forward to our monthly meetings!!! Thankful for today...That I am (again) starting to have less pain. Yay! Well, that's it for me today! I will be back tomorrow for Happy Homemaker Monday! Kat - so glad you are starting to feel better. I love your quote of the week! 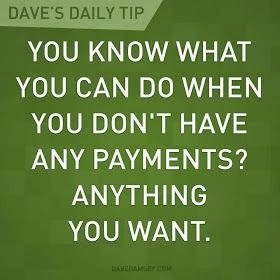 Hubby and I are living the "Dave Ramsey" debt-free way! I gave Downton Abbey another chance tonight and liked it better this week than last but sure hope the Anna tells Bates what happened and that they work things out...but I doubt there will be a happy ending to this one. Enjoy the week ahead. I may join in with Happy Homemaker Monday tomorrow since it is MLK day and I have it off! Have a good evening! Anna getting raped was a really hard program to watch! I thought Sunday's program was good. Debt free is the only the way to live especially when you get near retirement age. But truly if the young families could defer some of their wants they would be so much happier with less or no debt. Frees up more options! Thanks for visiting Carla! I am enjoying my Tracie Peterson book. Looking forward to the review on the one you're reading. First time reader, enjoyed your comments, think I'll go to the library and look at Tracie Peterson's books, I understand they have a nice library in Boardman, Irrigon's library is coming along, it will be beautiful when it's finished. I've been looking for a good book, maybe this will the void for reading. Have a good, pain free week Kat. Oh, dear sweet Evie, you found me:))) Thanks for visiting. Please come back soon! Downton Abbey is the best! You can watch the older episodes on Netflix if you want to catch up! Even my hubby looks forward to watching on Sunday Nights (9:00 pm on PBS).